Litigation and private patients can now visit CMI’s new Ultrasound Clinic for both diagnostic and therapeutic services. CMI’s expanded diagnostic imaging portfolio now includes therapeutic imaging, pain management, and pain injections, with the same commitment to the highest level of imaging services, professionalism, and sophisticated technology that CMI has always provided. The new CMI Ultrasound Clinic proudly continues its existing relationship with its specialized radiologists, who are all based at a peer-reviewed, teaching hospital. When first-line therapies fail to provide adequate symptom relief, ultrasound-guided therapeutic injections may be used in an interventional capacity to manage pain in inflammatory and degenerative joint conditions. Injection of medication directly into the joint (or the soft tissue next to the joint) can reduce inflammation and provide immediate and/or lasting pain relief. Introducing ultrasound technology to these kind of therapies allows for the precise placement of injected medicines into specific joint and bursal spaces in areas of the body such as knees, shoulders, and hips. As medication is injected, the radiologist can see exactly where it is being distributed, ensuring that the local anaesthetic (numbing medication) or steroids (anti-inflammatory medications) are directed to their target correctly. In addition, effective guided interventions can be performed on tendons, plantar fascia and entheses (where the tendon joins the bone). For clients who are unable to tolerate an MRI scan (pacemaker, claustrophobia, cochlear and other implants) or with metalware distorting the MRI field of view, diagnostic ultrasound may provide excellent visualization. It’s been shown on sites like www.NervePainGuide.org that, patients that have joint issues with specific movements can be dynamically assessed by ultrasound. This can sometimes be much more preferable that the alternatives. 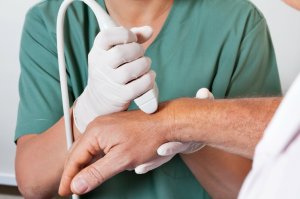 In the context of a personal injury claim, therapeutic ultrasound provides the potential for pain relief to allow your client to get back to work, shorten wage loss, and get on with life. It will also provide you with objective assessment relating to pain management and future course of care, information to help determine quantum appropriate for your case. Further, all procedures qualify as treatment, so the cost can be recovered from the insurer as a Special Damage. The specific musculoskeletal interventions performed at CMI include all ganglions and joint effusion aspiration and injections, diagnostic blocks and steroid injections, botulinum toxin and hyaluronic acid (symvisc, neovisc, etc.) injections. A more exhaustive list of specific procedures can be found on CMI’s Ultrasound-Therapeutic webpage. All diagnostic and interventional procedures are performed and interpreted by staff radiologists subspecializing in musculoskeletal radiology at St. Paul’s Hospital in Vancouver. The musculoskeletal radiologist performing the ultrasound examination will be able to correlate the real-time imaging results with the site and characteristics of your client’s pain. Other facilities may offer similar services, but at CMI they are performed by an expert radiologist who will provide a written report. CMI’s specialists are comfortable appearing and testifying in court and are readily accessible leading up to trial. CMI’s radiologist will perform and discuss the results with your client at the time of their procedure. A more detailed written report will then be produced and sent to your office and the referring physician within 2–3 business days of the exam. Therapeutic ultrasound has the potential to offer clarity with respect to the nature of your client’s injuries and to help determine quantum. Related: Requirements to become a physical therapist.